Mistveil Enchanter is a common Intelligence creature card. It is part of the Heroes of Skyrim expansion. "The power of the Mundus is at my command." "You're no match for me!" This card's summon ability applies the Steadfast card effect. 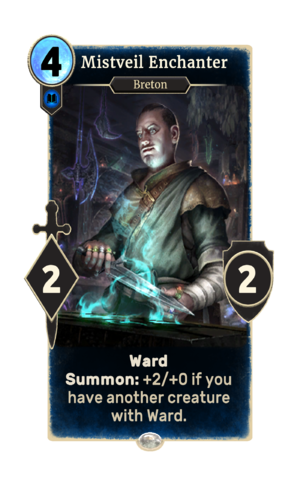 This card is named after Mistveil Keep in Skyrim. This page was last modified on 27 February 2019, at 22:49.